We’re not afraid to say it: we love a good horror story. 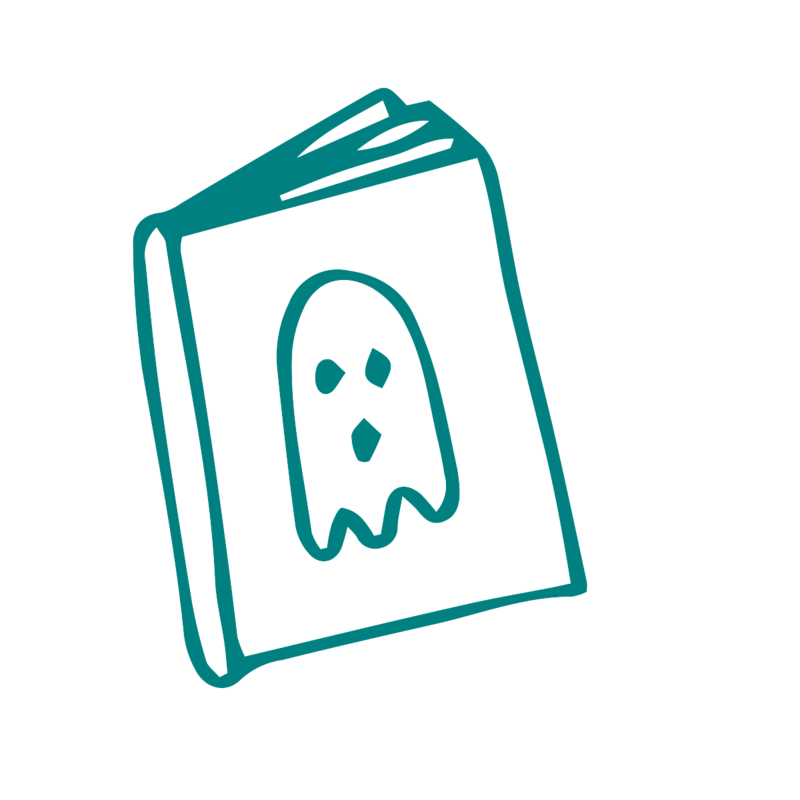 There’s something exhilarating about reading a ghost story knowing you’re safe and sound whenever you put the book down (or in the freezer). 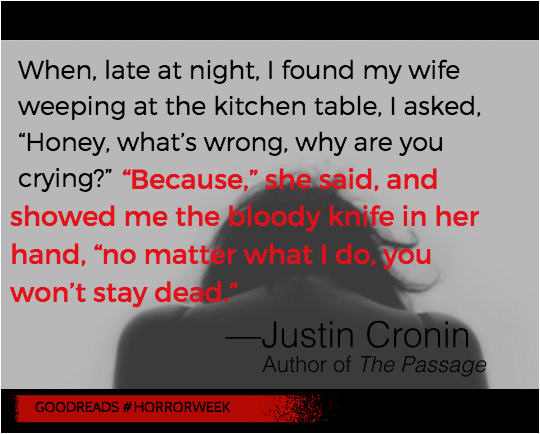 Here are five things authors can do to participate in Horror Week on Goodreads, which we’re celebrating October 16 – 22, 2017. 1. Take questions from readers. Like the monster under your bed, Ask the Author questions are only visible to you. Once you choose to answer the questions they become visible to your followers, and show up in your updates feed and the update feed of the person who asked the question. If you skip a question, it’s like it never existed (because nobody gets notified). Find Ask the Author on your Goodreads Author Dashboard when you’re signed into your account. Find inspiration by reading Best Practices here. 2. Tell us a two-sentence horror story. Any author – horror writer or not – can respond to this question on Goodreads (we’re looking forward to the creative replies!). We’re sending out an official question via Ask the Author on October 16, but start thinking about your favorite one now (find some inspiration here). Be sure to share a link to your answer on Twitter on you post it on Ask the Author to increase engagement. 3. Browse our list of top horror novels and shelve your favorites. Which books make your blood run cold? Connect with other readers over a shared passion for the macabre. Review the books you loved—just be wary of spoilers. 4. Trick or treat? Choose to treat your readers to some original content. We’re sharing five writing prompts that authors can respond to in the comment sections, on Twitter, the Goodreads blog, or in the writing section. You might also consider sharing an excerpt of your upcoming book or the cover – whatever you think will make readers scream (with delight of course)! 5. Tag social activity with #Horrorweek. This allows readers to discover your content across social channels, and gives you the chance to amplify your message to all those participating. These five things are just a few way to get you going. There are many ways to engage with readers on Goodreads and you can find the activity that’s right for you. Horror Week is just an excuse to have a ghoulishly good time! Goodreads Authors can subscribe to the Monthly Author Newsletter by editing their account settings. Can't wait for the 2-Sentence Horror Story to begin! I'm hoping to continue my exploration into the best horror novels of the 21st century. I'm in an anthology due out on Sept 30th so will be using this feature! Also looking forward to the 2-sentence horror stories. Two sentences is tons of space, especially if one of them is for life and they're served consecutively! Jen wrote: "Two sentences is tons of space, especially if one of them is for life and they're served consecutively!" I'm not a horror writer but, I will see what twisted 2-liner I can come up with. T.L. wrote: "I've written one horror novel, as long as there can be a genre known as Cosy Horror. :)"
T.L., "Cosy Horror" sounds intriguing! Which of your titles fall(s) under this category? I think I need to read it (them)! Got my true kindle vampire story out free from today (6th until 10th Sept) but will be posting sentences come the time. Launching on 10th September - so new it hasn't been reviewed yet! Can you help? Please take advantage of the first two days FREE download from Amazon, read, laugh and review... Thanks! This year's Horror Week will be my first - looking forward to the 2-sentence Horror Story! I've got my "two cent"ences ready! "This stew's nice," she said. "Where's granddad?" I am looking forward to every event! The challenge of two sentence horror writing is mouth-watering. The release date for Plague is October 31st...preorder link below. "Don't be out...when the moon comes up." I'm in for the 2 sentence horror story. I'm so wordy that this has got to be good for me. Perfect timing for the Oct 23 release of my next shapeshifter paranormal PRINCE OF FOOLS. What a great event! I skip Horror, but like this photo. I don't do scary and/or gruesome. The Ask the Author question should show up on your Author Dashboard today, and we also crafted some writing prompts for some spooky inspiration. Looking forward to reading some great stories this week! Cynthia wrote: "The Ask the Author question should show up on your Author Dashboard today, and we also crafted some writing prompts for some spooky inspiration. Looking forward to reading some great stories this w..."
thanks for posting this. I looked for it this morning but it wasn't there! For #HorrorWeek I have created a short book trailer on YouTube for my book. Magnus wrote: "Is there a way to return to the question once I've skipped it? " You can use your blog though to share the story - your followers will still see it, plus they can engage with it just as they can with an ATA answer. Cynthia wrote: "Magnus wrote: "Is there a way to return to the question once I've skipped it? " You can use your blog though to share the story - your followers will still see it, plus they c..."
I wrote a story for Horror Week. "The Nonexistent Ghost"
L.S. wrote: "I wrote a story for Horror Week. "The Nonexistent Ghost"
I finished and posted my first two-sentence horror story. WHEW! I'm like you, Melinda--a little wordy--so it took me some time to pare down. But what fun!!! !